Learning to forage mushrooms. 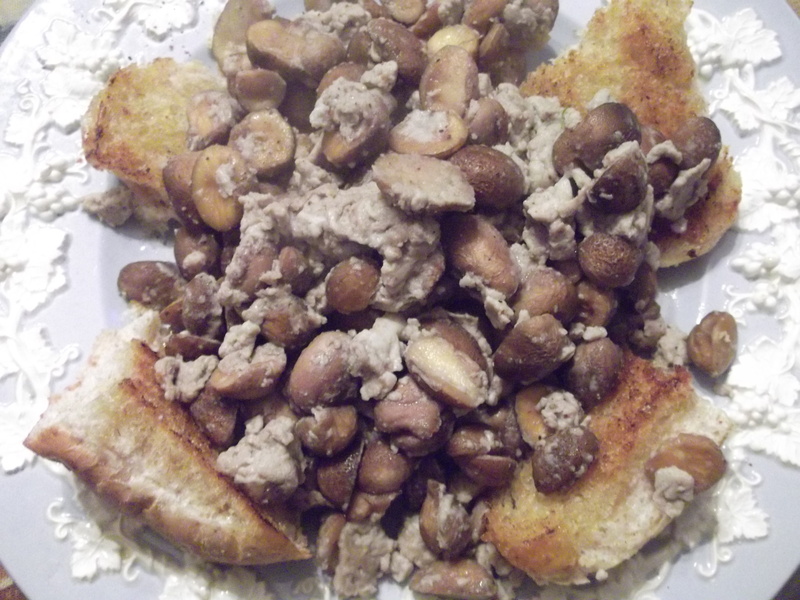 Stump puffball recipe. 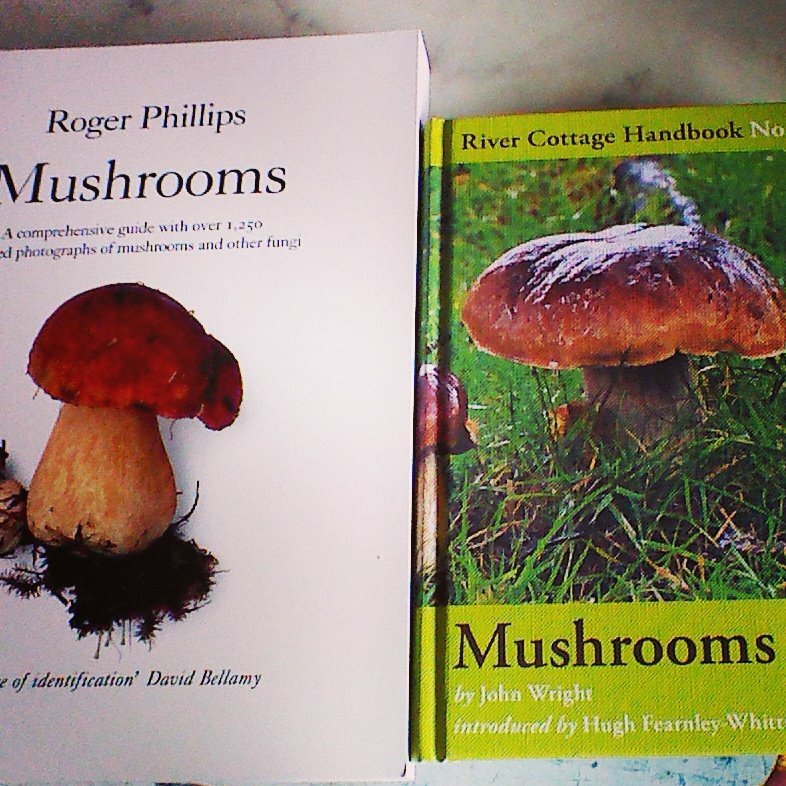 I invested in Roger Phillips brilliant ‘Mushrooms’ book and John Wright’s River cottage Mushrooms handbook. I have consulted them heavily and read the latter cover-to-cover as a book one evening. Its very handy to carry out with you. I also booked myself on my first fungi talk and foray. Mushroom foraging is a skill based on a lot of knowledge, and experience. I am aiming to document my experiences, progress and share recipes as I learn. 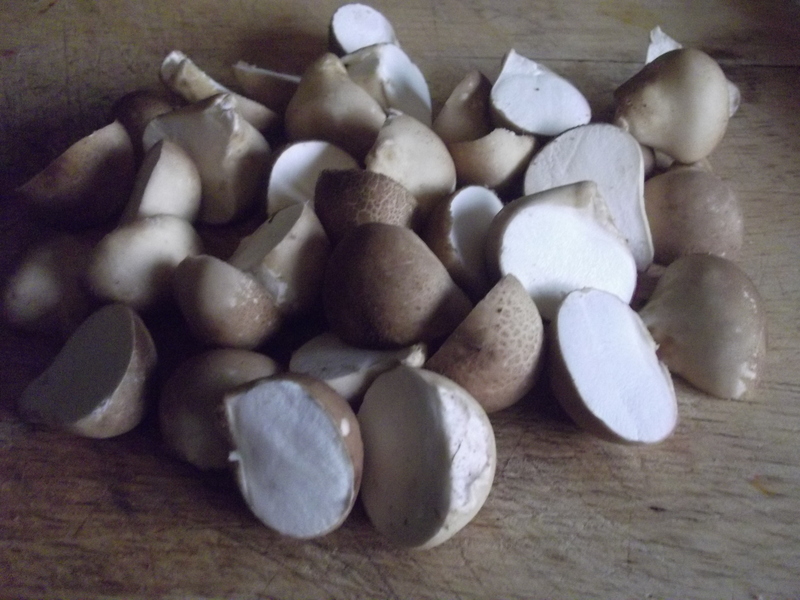 It will be some time before I will describe myself as a mushroom forager. I need to be both ‘in the field’ studying habitats and fungi in their environments and in a book reading and learning and checking, and checking again in more books, observing more and checking again. It’s not worth picking anything until I have a fairly good idea what it is and I know that it is not poisonous. Consider also, what is to be gained from picking it if you know you aren’t going to use it? It is useful to insects and acting as a host to micro organisms where it is. 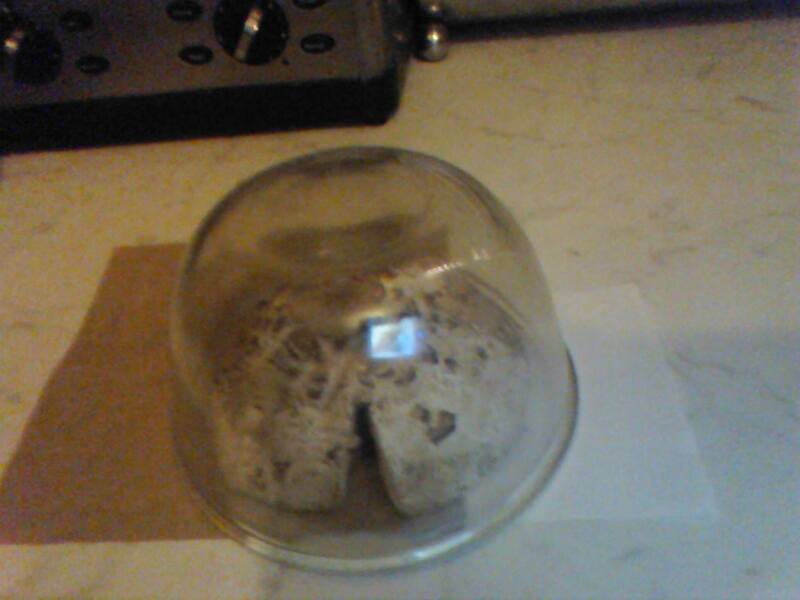 That said, it’s not destructive to pick mushrooms, it wont damage the mycelium which is the main part of the organism, that is living in the earth. I will often need to pick a specimen in order to examine closely at home. I learned the hard way for myself how just complicated it can be after picking specimens to examine which I will share with you in a bit before we get to puffballs and recipes. A good starting point is the edibles that are more difficult to get wrong or get confused with anything very poisonous. I have found John Wrights book useful in getting familar with some of these. He imparts a great deal of knowledge and wisdom with a healthy dose of humour and a few clever mental images that leave you more clearer on the bigger picture. Roger Phillips wonderful book has an invaluable photo of sets of mushrooms in various stages for each species and a very broad selection. Phillips will inform ‘edible’ under an inkcap (in my edition he tends to favour ‘edible’ inedible’ ‘unknown/suspect’ and ‘poisonous’). Wright tells you that if you have consumed any alcohol then ink caps become very poisonous (technically alcohol poisoning as a chemical present in the ink cap which is not a toxin, prevents your body from breaking alcohol down in the usual way) it has been documented that even alcohol in perfumes and deodorants causes reactions in some people. It is a tricky business. You need more than one or two books and you need to pay careful attention to more than the pictures. 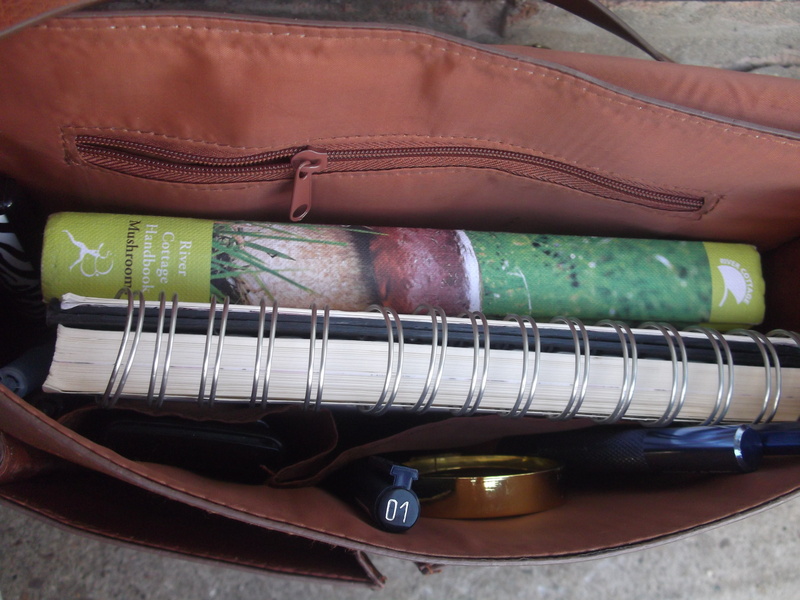 Knowing where to look/where mushrooms are likely to be growing, and finding your own places to forage is essential. 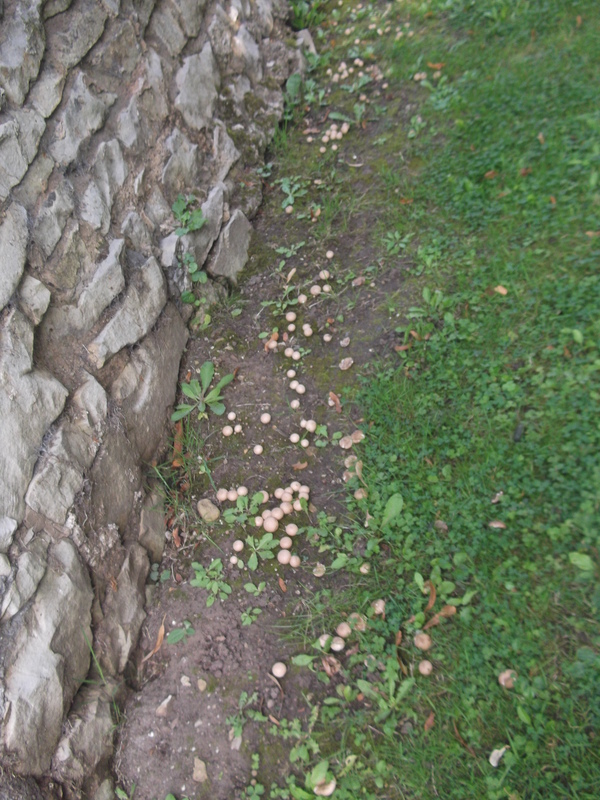 Mycelium is the main part of your fungi and it grows under the ground you can sometimes tell where it is by the grass. The grass may vary in colour from where the mycelium has enrinched it, or drawn from it. If the mycelium is happy we dont get a mushroom, we get a mushroom where the mycelium cannot continue to spread and grow -the edges of likely environments, grassy parts of woodlands, near the carparks and road verges. Though we dont have led based petrols anymore it is wise to consider pollutants, especially as some mushrooms concentrate them, if you wouldn’t eat blackberries next to a busy road then mushrooms aren’t a good idea. Parks may be good spots to forage but consider that some very well managed ones will not leave fallen trees or cut logs, and debris that the fungi need to grow. 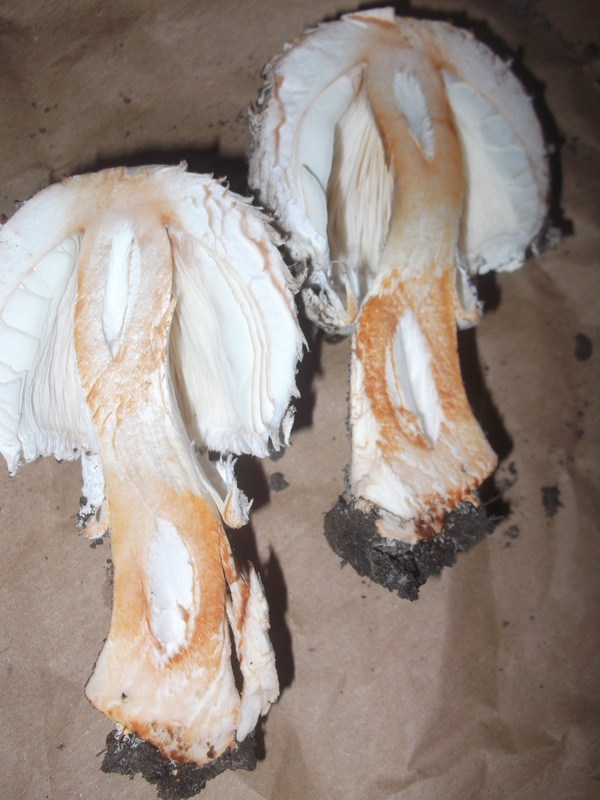 John Wright also points out in his book that although he has foraged in parks and they may be the only possibility sometimes, it is wise to check carefully as on one occasion he picked some mushrooms which had been dusted in a a fungicide that was barely noticeable. You will also need to know what your fungi is growing on, for example Yew contains toxins so you might not want to eat anything growing on that. Most mushrooms have a symbiotic relationship with trees. Sometimes when they appear to be in the soil they are connected to a part of a tree that is/has become buried. My ‘Tool kit’ so far. A basket is now a high priority in order to ensure I dont damage delicate mushrooms. I used an open weave fabric bag to carry my first forage as I wasnt really expecting to find anything and you cant use a carrier! Learning how to identify, learning about what you’re looking at, and what those little differences mean is crucial, many times a single subtle difference that goes unnoticed by the untrained eye is the key to a succesful ID. There is little point in me looking unless I know or am learning what these are. This is where your field guides come in handy. You will then need a few tools to examine a likely looking specimen; a knife, a magnifying glass, a notebook and a camera to photograph the identifying parts. Such as the cap size, shape colour and texture, and the same for the stem, and does it have a ring? gills or tubes? where do they join to the stem? The colour of the gills? and how they are attached to the stem? how thick and how dense are they? the texture of them and if they fork or not. The smell colour and texture of the flesh. 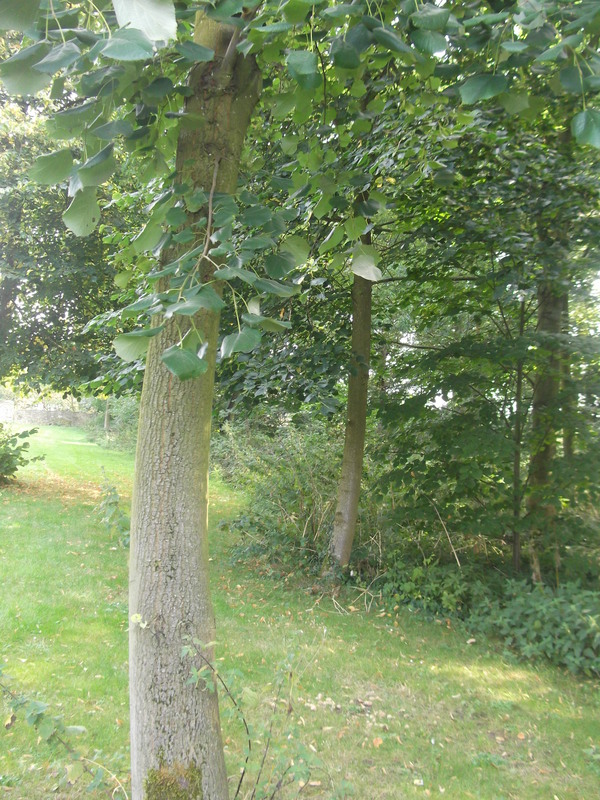 The colour of the spores and the habitat, the trees nearby. Much of this I can note ‘in situ’ a camera and notebook help me remember and record these details -and of course, where the mushrooms were. You might need to collect a specimen to test and examine further and check with your books when you get home. 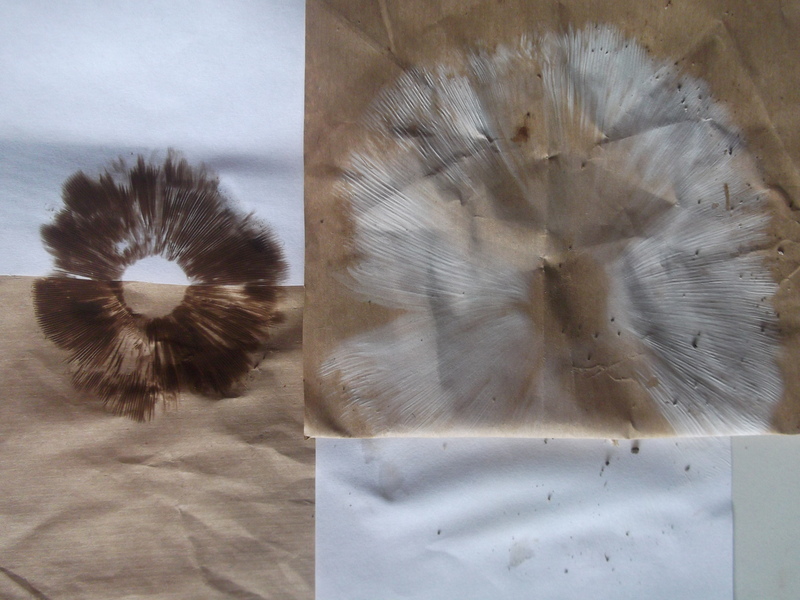 You may also need to do a spore print. Sometimes flesh stains upon cutting which is both good and bad, dependant on your species. Good for a parasol. (If it is one.) Smaller parasols may be confused with poisonous dapperlings. Bad for a field mushroom. 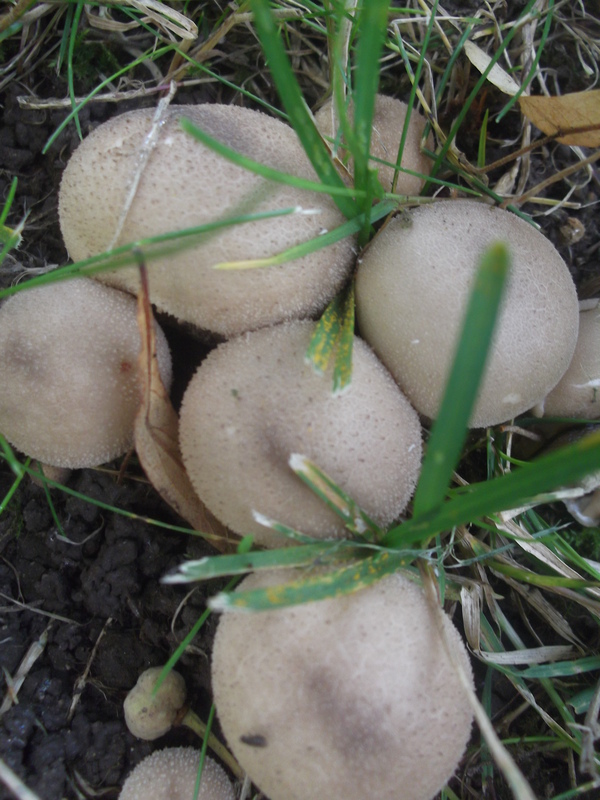 You do not want yellow on the base of your field mushrooms as then they become ‘yellow stainers’ which are likely to cause stomach upset and are the most common cause of poisning from mushroom foraging in our country. The clincher with both of these (after the size of a large parasol) is the smell, if the field mushroom smells at all ‘chemical’ like ink or detergent then it is a ‘yellow stainer’ and your parasol will smell distictively of warm milk. Not species generally recommended for a novice. Mine smelled bad. I also learned that a shaggy parasol is an amanita and contains toxins -though considered ‘good’ and edible. It must be carefully and fully cooked to break down the toxins and to avoid stomach upset, a smaller piece first is always advisable to check how you personally react (it can vary person to person). I felt out of my depth with these species. I would not assume every mushroom I pick in the same area which looks the same is the same species -and the diferences can be quite subtle. Not all cases of poisoning are caused by mistaken IDs, sometimes an individual can have a reaction where another doesn’t (chicken of the woods is one example). Some toxins in mushrooms react differently depending on the individual, and you may eat something a few times and be fine, and then not. On occasion the knowledge about particular mushrooms and their complicated toxicity becomes more evidenced and something widely considered ‘good’ becomes known to cause reactions in certain situations. Sometimes it may be due to incorrect preparation and cooking. So I learned that all wild mushrooms should be thoroughly cooked and you should always try a small portion first to see how you react. Never consider eating anything unless you are 100% confident that it is safe. 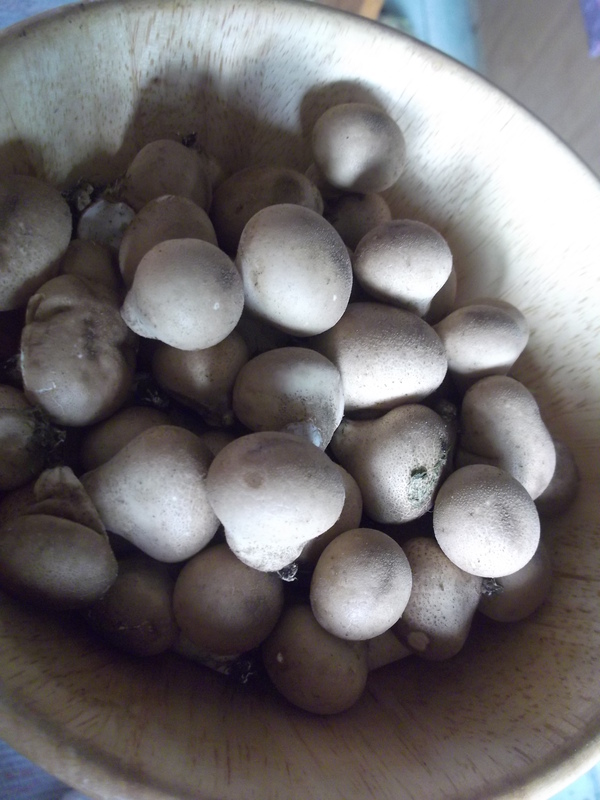 My first forage were some stump puffballs. Most puffballs are edible. You would eat a spiny one because -it is spiny. The only thing you could confuse puffballs with is an earthball, which is unpleasant but not poisonous (or not seriously so). A young (still veiled) amanita mushroom (seriously poisonous) may bear a resemblance to a common white puffball. Be sure and cut them in half lengthways, if the texture is pure white and firm with no trace of forming gills or colour then they are good to go. As they get older they develop their spores inside and you will see signs of age outside, and this change in the centre, they are very unpleasant by then. Stump puffballs are the only puffballs to grow on wood, beech (which may be buried, as in this case). I decided to go back a few days later and took some pictures so you can see what they look like when they start sporing. 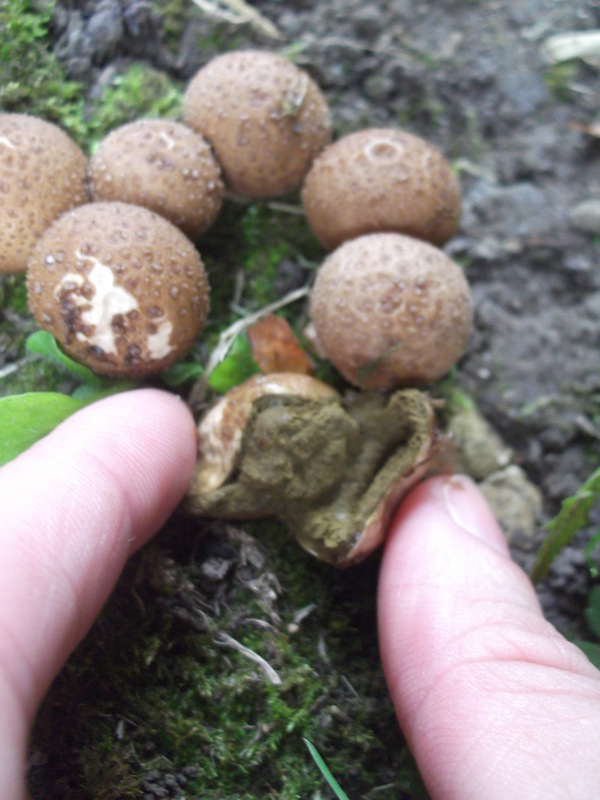 Puffball spores are produced internally, in a spheroidal fruiting body called a gasteroid (‘stomach-like’). As the spores mature, they form a mass called a gleba in the centre that is usually of a distinctive color and texture. Eventually it dries, becomes brittle, splits, and the spores escape. So I learn that it is often in the timing and with luck, after searching likely environments. I hope to discover a few patches to search around the same time each year. This will mean checking regularly, and keeping an eye on them. Sometimes they dont return and sometimes they appear where they weren’t before. Very young mushrooms dont have much flavour so its best to wait ’til they are bigger but not getting past their best, or containing maggots as may happen to larger but outwardly healthy looking mushrooms. It’s generally advised that picking sustainably means leaving the older/elderly looking ones to spore, with the younger less tasty ones, and taking around two thirds of the rest. The stump puffball is a beige colour, rather than the white of a common puffball, which often gets it confused with the inedible earthball. Earthballs have a slightly different shape and are hard. 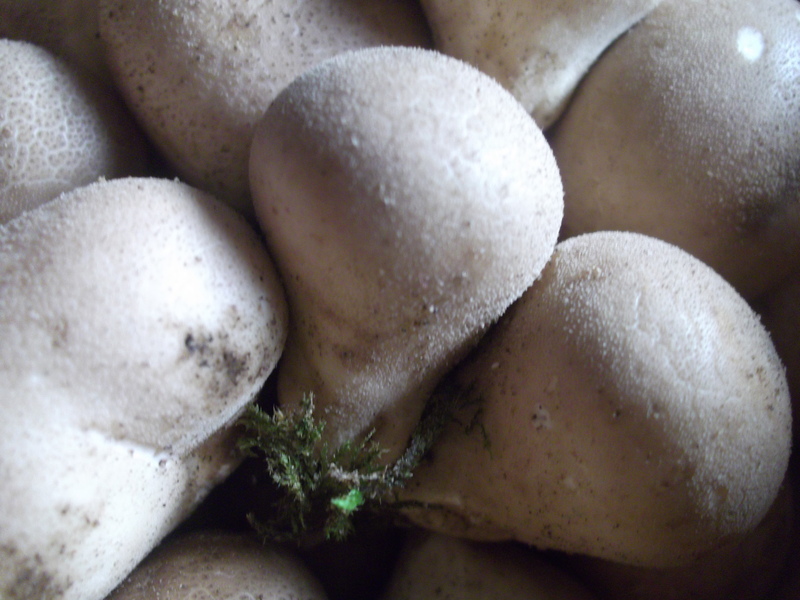 This puffball has a marshmallow texture, the flesh is firm spongy and completely white. The skin which is left on (but often peeled on the larger puffball variety) has a powdery feel. 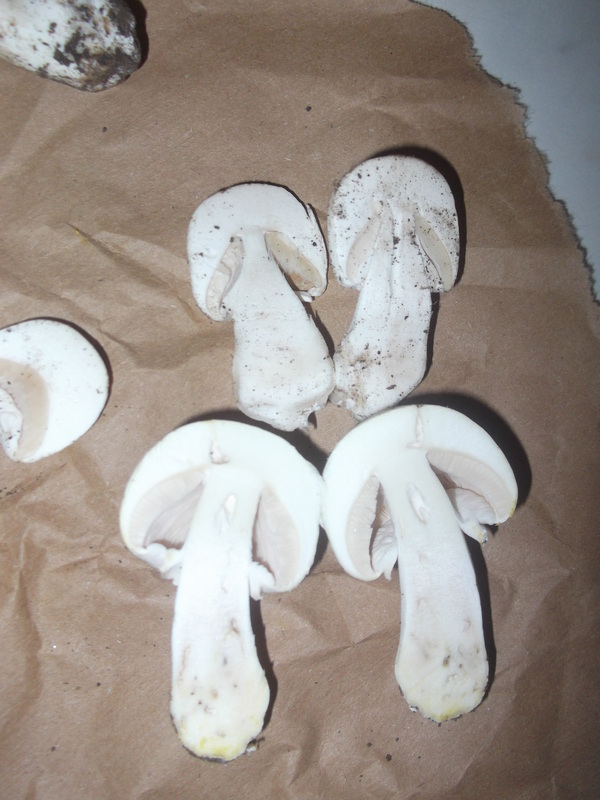 A more experienced friend also confirmed my thought that they were edible so after examining my specimen and researching, I went back for more. I examined every single one closely before I prepared them for cooking, and cut each one in half lengthways as part of this process. I intend to develop good habits and stay safe. I poured a bit of rosemary oil into the pan (infusing oils is on this blog if you want to have a go) and fried my bread. Then added the mushrooms, keeping the heat low to sautee them, gently softening, they need about 10 mins to be cooked right through. Scramble the eggs in, add salt and pepper to season. I added a little cube of my homemade frozen elderberry and blackberry jus -for a treat since it was my first meal of foraged mushrooms for supper.